VANCOUVER — The Prairie boys basketball team did not know and did not need to know about the possible changes to the Class 3A bi-district tournament. “Win the game, then play on Friday and gain our spot (to state),” junior Aidan Fraly said. 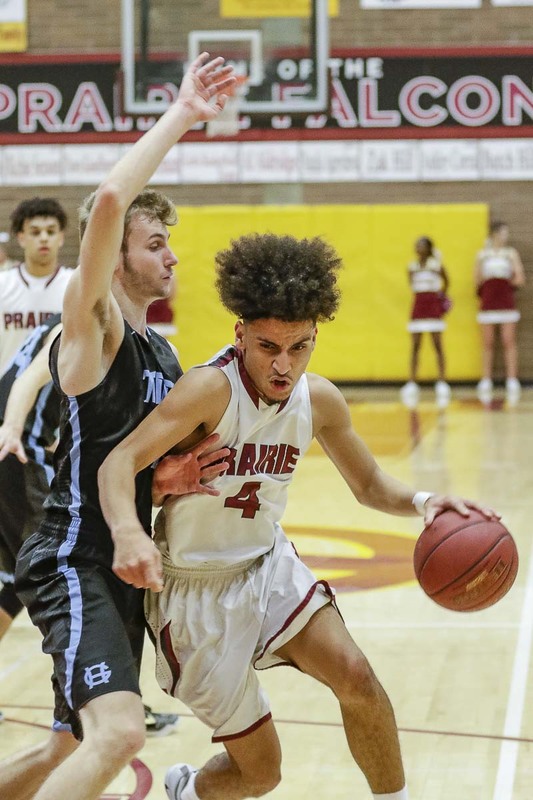 Fraly and Kameron Osborn each scored 16 points, and the Falcons pulled away from Gig Harbor in the second half Wednesday for a 56-41 victory in the opening round of the tournament that will eventually determine state berths. The bi-district is a double-elimination tournament at this point. However, due to a forecast of snow over the weekend and the possibility of more next week, tournament officials were trying to figure out their options. One was turning Wednesday’s round into single elimination. Prairie coach Kyle Brooks said he and his staff learned about that scenario just hours before Wednesday’s game. But with nothing determined, he opted to keep it quiet. The Falcons were never that desperate. 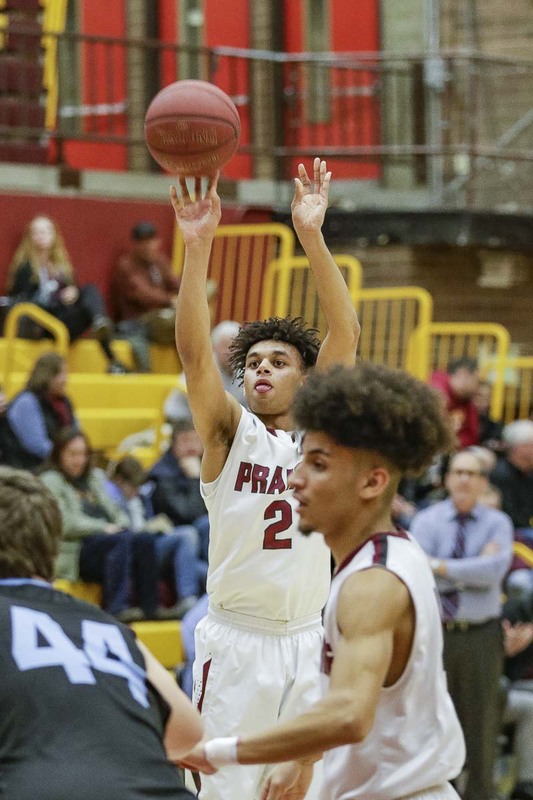 Gig Harbor played tough for three quarters but Prairie used a 12-2 run in the third to take the lead for good, then cruised in the final quarter. Taking care of business was Priority No. 1 on Wednesday for the Falcons. Then they had to wait. Cale Piland, the athletic director for Evergreen Public Schools and one of the bi-district tournament officials, said a decision will likely come late Thursday afternoon. There are four leagues in the bi-district tournament, and they all must come to a consensus. The Falcons did not know they might have had to win, but they knew they wanted no part of the consolation bracket. 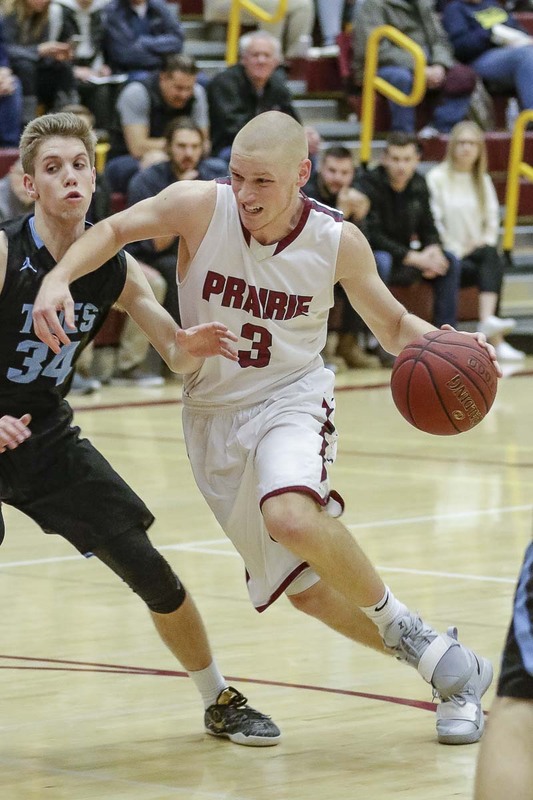 Kameron Osborn scored 16 points Wednesday in helping Prairie advance in the Class 3A bi-district tournament. Prairie beat Gig Harbor 56-41. Fraly scored six of the team’s first eight points to set the tone. He hit six consecutive free throws in the fourth quarter. He also had five steals, and a blocked shot. In fact, that kind of described Prairie’s night. Fraly said the team struggled in the first half, then talked about it at halftime. A.J. Dixson had a lot of fun shutting down Gig Harbor’s big threat. Kaden Garnaas made four 3-pointers in the first half but did not score again. A.J. Dixson also converted a three-point play to ignite the final push to win the game. On the next possession, Zeke Dixson scored off an assist from A.J.. 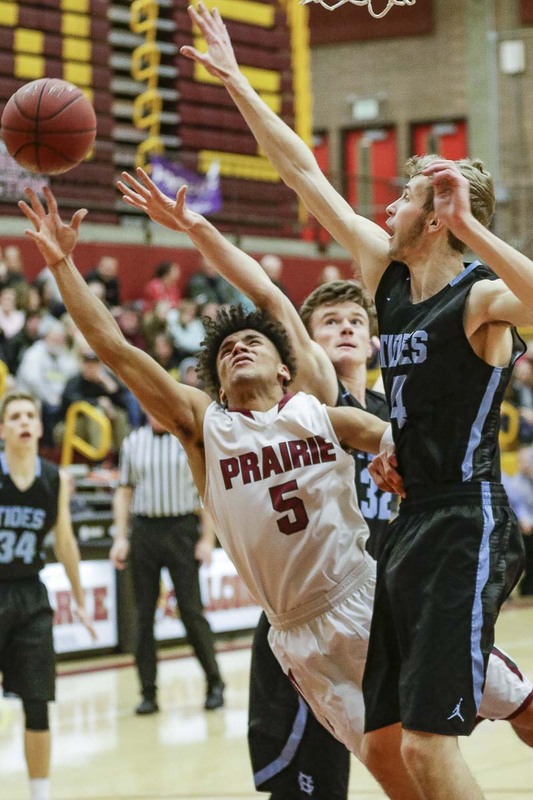 The next trip, it was Zeke Dixson grabbing an offensive rebound, setting up a bucket for Bronson King and a nine-point Prairie lead. Prairie would end the game on a 17-2 run. Now, the Falcons are a win from making it to the state tournament. “At the start of the season, we didn’t even think about going to state,” Fraly said. Brooks said he knew this season was going to be a challenge. Then the team started 2-6, including 0-2 in league play. Prairie, though, has reeled off 11 consecutive wins to get here. “I’m still kind of in awe we were able to do that,” Brooks said. In other playoff games, the Battle Ground boys won their play-in game for the Class 4A bi-district tournament. The Skyview girls also won their play-in game. The Class 2A Greater St. Helens League wrapped up its girls basketball regular season Wednesday. The district tournament is scheduled to begin Friday. The boys tournament is starting Thursday. The Class 1A boys and girls district tournaments also are scheduled to start Thursday and Friday. ClarkCountyToday.com will have an updated story on the schedule changes.